Enjoy a 75-minute tour of London on board a vintage 1960s Routemaster bus that has been transformed into a state-of-the-art open-top sightseeing experience. Hand-picked comedic tour guides will point out all the major attractions of the city, while also presenting you images and video footage of the most famous landmarks and monuments. Admire sights along the route, from the Tower of London and Tower Bridge to the Houses of Parliament, The Shard, and St. Paul’s Cathedral. Enjoy the music and sound effects that enhance the experience, ensuring the most entertaining sightseeing tour around. The tour buses are equipped with high-definition screens and a custom-designed sound system. With footage of London through the ages and site-specific music and songs, this tour immerses you in the London experience. Discover the top attractions of London in just 75 minutes. 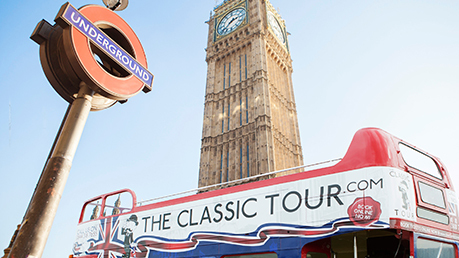 Experience a tour in a classic 1960s Routemaster bus. Enjoy the entertaining first-class comedic tour guides. • The Ghost Bus Tours take no responsibility for items left on the bus. Personal items are carried at the owners risk and The Ghost Bus can take no responsibility for items damaged or lost. 4 March - 8 September Monday - Sunday 12.05, 14.10 & 16.10. 9 September - 1 May Monday - Sunday 12.05 & 14.10. Closed 24 - 25 and 31 December.